I was surprised to find how many people wanted to smell like laundry. Can you really blame them? 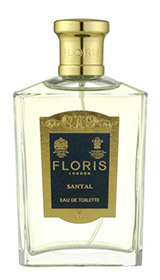 Laundry scents are among some of the most finely tailored fragrances out there. While perfumes are an artistic canvas where the lives of the abstract smells dwell, laundry detergent and other household cleaning or hygiene products is the world of the wildly successful but ultimately uniform. And then there’s Cotton Blossom. In Bottle: Sharp and floral. This smells so benign. And benign in this case is a compliment because what else is Cotton Blossom really trying to achieve but that ultimate laundry smell? Applied: Goes on sharp and clean. Clean in all caps even as Cotton Blossom wastes no time at all telling you what it’s going to be about. And what it’s about is laundry and soap. This smells like any number of laundry smells you may have enjoyed. It’s slightly flowery, it’s powdery, it’s huge on the soap, it’s sharp and clean white musk and it’ll make you feel fresh and neat and there’s nothing else to it. The opening stage is a bit sharp and this stuff goes on strong. It mellows out a bit in the mid-stage where the sharpness is rounded out a little and the powder becomes more noticeable. Cotton Blossom, strangely enough, smells a bit watery on me in the dry down but maintains its powdery floral personality. Experiencing this was like smelling laundry detergent, pouring it into the machine, then turning it on. Sharp initial blast, mellowed pour, mixed with water. Kudos to Bath and Body Works for this one. If you want to smell like laundry, Cotton Blossom’s your gal. Extra: For what it is, Cotton Blossom has surprisingly awesome longevity. So while this doesn’t come in eau de toilette or eau de parfum, I don’t think this fragrance needs to be any more potent. Design: Cotton Blossom is presently available in a body mist form in Bath and Body Works’ older design. So you don’t get anything special. Just a tall bottle that’s entirely plastic with a semi-transparent label bearing the fragrance’s name and theme. The best thing about the body mist at Bath and Body Works is you get a ton of fragrance for very little money. There’s 236ml in a full size. Notes: Sun dried linen accord, grass, mandarin blossom, jeans accord, peony, cotton, musk, baby powder. I will never be able to take that notes list seriously. Never. I love how playful the list is though. 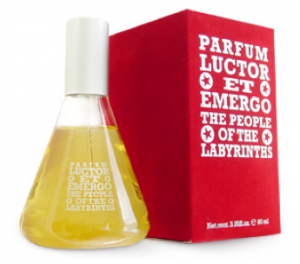 Anyway, Demeter also has a fragrance that’s supposed to smell like laundry in Laundromat. I vastly prefer Cotton Blossom as it lasts longer and is far cheaper. Reviewed in This Post: Cotton Blossom, 2010, Body Mist. Daisy is one of the most popular modern fragrances that is widely available through many different stores. You can find this thing sitting in department stores, drugstores, boutiques, you name it. And it’s not hard to see why. Daisy is a light, playful, fresh and clean scent that was made to appeal. Like the Acqua di Gio of the 2000s. In Bottle: Green and grassy with a light violet leaf giving it that green grassiness. The fruits in this are detectable but they’re watery–not sweet and honestly, they don’t need to be. Applied: Fruit is the first thing I smell, diluted and tamed fruit. Most of you time you would think of fruit notes as being sweet and loud but the ones at play in Daisy are much more subdued. The mid-stage is characterized with a blend of fresh and clean smelling flowers and the persistent edge of green grass. I smell the gardenia most of all in the mid-stage which is a really addition. The dry down is a pretty and sheer musky vanilla. Daisy is the representation of a beautiful green meadow, a light breeze, and a happy frolic. It’s care-free, girly, clean and fresh. It’s also very, very light as I find myself having to use more Daisy than I would any other fragrance to catch my scent in the morning. The fact still remains though that this is a great modern fragrance that truly earns its badge as one of the most popular available fragrances. Extra: Daisies do not actually have a scent. 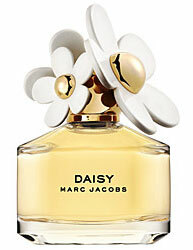 Marc Jacobs’ Daisy invokes the concept of what a daisy would smell like instead. It should be noted that you may find Daisy and Daisy in the Air available in stores. Daisy in the Air is the exact same fragrance in a limited edition bottle with blue flowers. Unless you are in the market for a new bottle of Daisy, do not drop the cash on Daisy in the Air because it is not a flanker, just a redesign for the bottle. Design: Cute little curved glass bottle with an equally adorable topper covered in white (or blue in the case of Daisy in the Air) flowers. I had originally thought the design for this fragrance was a little hokey but those flowers get to you so that even the most minimalist of us are swayed by those infectious little flowers. I gotta admit now, I like the bottle design. It’s cute and playful and effective. The rubber flowers are what cinched the deal. Another thing to note of Daisy in the Air, aside from the blue flowers, it also comes with a garland that you can spritz with scent and hang in the room so that it disperses fragrance throughout the place. I think it’s a cute gimmick but again, this isn’t a flanker, it is just the exact same smell as the regular Daisy packaged differently. Reviewed in This Post: Daisy & Daisy in the Air, 2010, Eau de Toilette.